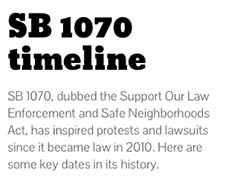 Click the graphic to review key dates in the history of SB 1070. PHOENIX – The American Civil Liberties Union filed a lawsuit Thursday challenging the constitutionality of SB 1070′s requirement that law officers to determine whether someone is in the country illegally if they have reason to suspect it. Courts have blocked key provisions of the 2010 law, but a 2012 U.S. Supreme Court ruling upheld Section 2B, often referred to law’s “show me your papers” provision, because no specific person had alleged being harmed by it. The ACLU’s case involves a Maria Cortes, whom the suit contends was delivered to the Border Patrol and detained for five days after a 2012 traffic stop because she couldn’t provide Pinal County sheriff’s deputies with proper immigration papers. Cortes had a pending application for a U visa, issued to immigrants who have been the victims of domestic abuse. “This detention resulted in a pretty horrific experience for her and her family,” Lopez said. Cortes and the ACLU are suing on the basis that detention without a warrant violated Cortes’ Fourth Amendment right to being free from unreasonable search and seizure. “Because of the prolonged stop at the side of the road and the subsequent transportation by the deputies to the Border Patrol, those are violations to her Fourth Amendment right to be free from being detained without probable cause,” Lopez said. The Pinal County Sheriff’s Office emailed a statement attributed to Sheriff Paul Babeu saying that deputies complied with SB 1070 after determining during a traffic stop that she didn’t have a driver’s license or insurance and after Cortes said she wasn’t in the U.S. legally and had a pending U visa application. “Our deputies took the exact actions as what is required by law,” the statement said. Lopez said that the lawsuit isn’t the first filed by the ACLU regarding SB 1070. The group filed a 2013 claim with the city of South Tucson that was settled outside of court. “We’re looking extensively at the impact of the law across the state,” Lopez said. 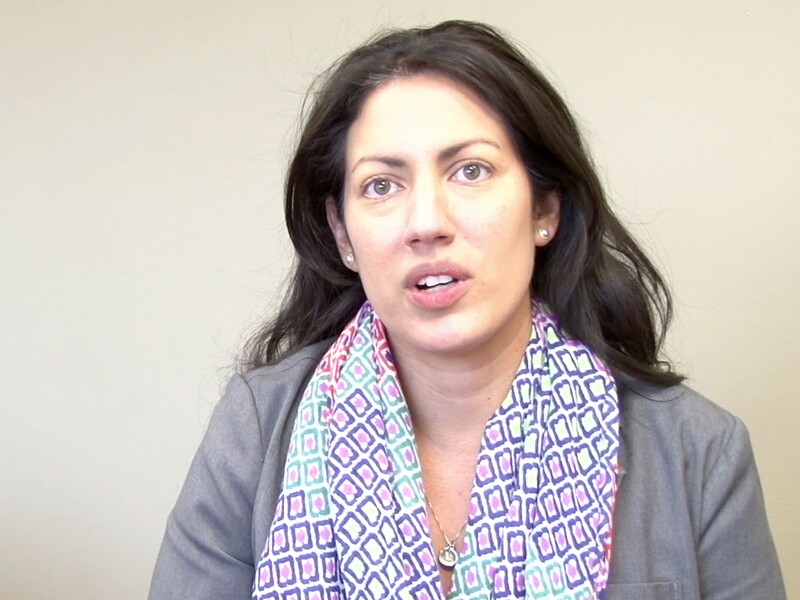 Victoria Lopez, policy and advocacy director for the ACLU of Arizona, said a federal lawsuit challenging SB 1070's "show your papers" provision is a way to show that the provision has caused harm to at least one person.